5. Move the Intro Match Point marker in the Intro Range to the beat where the vocals say "Let's Go...Yeah", which is 16 counts past the first beat. 7. Hold CTRL and drag the Intro Range Start marker to snap to the first beat. 8. Hold CTRL and drag the Intro Range End marker 16 beats past the Match Point. 10. Set the Post-NPI value in the Intro Range to 60. 11. Move the Outro Match Point marker in the Outro Range to the last cymbal sound at the very end of the song. Zoom in on the Match Point marker, and finely adjust it to the very beginning of the cymbal sound. 12. Hold CTRL and drag the Intro Range Start marker to snap to the beat where the vocals say "Take that, rewind it back.." which is 32 beats before the Outro Match Point. 13. Hold CTRL and drag the Outro Range End marker 1 beat past the Match Point. 14. Set the Pre-NPI value in the Outro Range to 90. 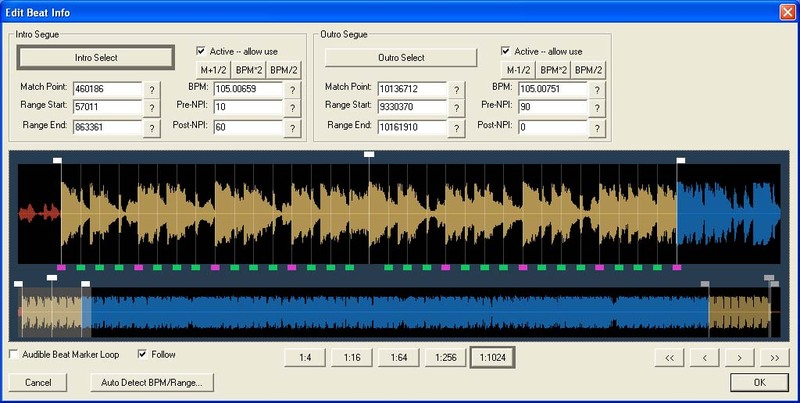 Yeah by Usher is now ready for Automated Beat Mixing in OtsAV.